The theory of fresco as the standard painting technique in Roman wall paintings, formulated in the mid-1960s by Paolo Mora and Laura Mora and Paul Philippot, has enjoyed general acceptance among specialists to the present day. However, the fresco theory is based on a series of postulates—such as the feasibility of fresco on pontate, the presence of giornate, or the use of alkali-sensitive pigments—which appear to be unsupported by physical or experimental evidence and which would require further assessment in order to validate the theory. Additionally, chemical analyses of Roman murals have identified the presence of various types of organic binders. A comparative study of these analyses reveals a remarkable difference between results obtained by the different researchers. The clustering of results by research group appears highly unlikely, suggesting the possible presence of confounding factors which could lead to distorted results. These factors might be related both to the difficulty in extracting ancient paint media and the influence of biological contamination. If the extraction method used is not adequate for an ancient binding medium, then part of the binder may not be extracted, producing an incomplete characterization of its composition. The lack of data on both the efficiency of the methods used and the possible influence of microbial contamination in the organic material may cause uncertainty in the degree of reliability of the different results obtained, fomenting uncertainty around the techniques used in ancient paintings as well as the treatments suitable for their conservation. Therefore, in the analysis of ancient paint media, the implementation of a protocol of assessment of both the efficiency of the extraction methods and the influence of biological contamination seems advisable. During recent decades, the theory that fresco was the most common painting technique in Roman murals has enjoyed general acceptance among specialists [1–3]. As a result, it is now common practice in museums to state that fresco was the technique used in Roman murals within their collections [4–10]. However, recent studies of the paint media used in these paintings seem to question the validity of the fresco theory, as most current analyses detect the presence of organic binders. These binders are as varied as wheatpaste, egg and emulsified beeswax. These studies have opened a new perspective on Roman wall panting techniques, which is the subject of the present work. The diversity of paint media identified seems to suggest the use of various painting techniques in Roman murals. According to this hypothesis, it would be expected that, when studies analyse samples from different archaeological areas and periods, various types of binders will be identified. However, contrary to those expectations, the results of such studies have proven rather homogeneous. Corso, Gelzo and co-workers analysed the composition of binders in unrestored Roman wall paintings from Villa Imperiale, Pompeii (first century AD) , from Liternum, Italy (first century AD) , and in fragments of the four Pompeian styles (200 BC to 79 AD) from the Marcus Fabius Rufus House, Pompeii [13, 14]. The results indicate the use of a wheatpaste-based paint in all the samples that allowed for the identification of the binder. These studies are probably the only ones detecting this technique Roman wall painting. Yet remarkably, this uncommon technique was found in most paintings studied by this research group, raising questions about possible causes behind the singularity of these results. A research team with which the author has collaborated analysed paint binders in unrestored Roman wall paintings from Ampurias, Cartagena, and Baelo Claudia, Spain, dating from the first century BC to the second century AD . In all the samples studied the paint medium was hypothesized to be emulsified beeswax. This study of paint samples randomly selected from different archaeological areas seems to point to extensive use in Roman murals of a binder made from emulsified wax. This extensive use seems to be confirmed by similar results obtained in a study carried out by the same group on unrestored Roman wall paintings from Mérida, Complutum and Marsala which will be discussed later. As in the case noted in the previous paragraph, these results are inconsistent with those found in the literature, as the presence of emulsified wax has not been reported in other studies. Another research group has further analysed the binders in wall paintings at the Villa of the Papyri , and in a painted wooden ceiling at the House of Telephus Relief, both in Herculaneum (and dating to before 79 AC) . In both paintings, results indicated the use of egg tempera. This group has also analysed Mycenaean wall paintings at the Palast of Nestor in Pylos, Greece (before 1180 BC) , on an Etrurian wall painting (fourth century BC) , and on an Etrurian sarcophagus of painted alabaster (fourth century BC) . Again, egg tempera was hypothesized, suggesting widespread use of this technique in ancient Mediterranean cultures, both in wall painting and on other types of supports. It is significant that the studies mentioned in the two preceding paragraphs have not detected the presence of egg in any of the samples studied, and that some analysis specifically reports lack of egg in the murals of Pompeii and Herculaneum . As in the two previous cases, the results obtained by these researchers were consistent with each other, but inconsistent with findings by other teams. 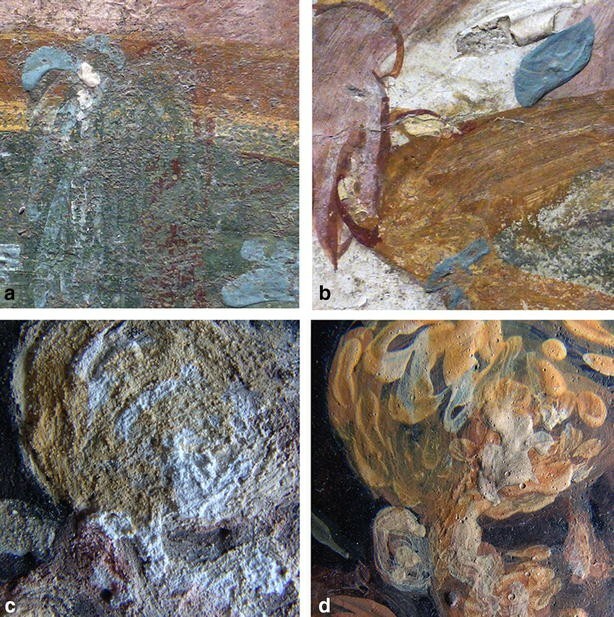 Elsewere, Casoli and co-workers analysed the organic binders in wall paintings from various houses in Herculaneum  and Pompeii , and the painting technique was hypothesized as being fresco in all the samples. 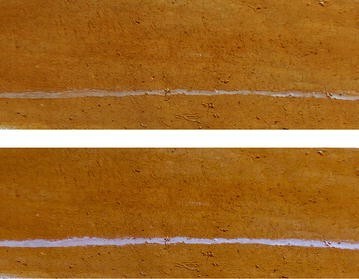 This technique has not often been identified in studies analysing organic binders in Roman wall painting. Therefore, the ratio of samples ascribed to fresco in these studies seems to be remarkably high compared to other studies, This high ratio between samples ascribed to a specific painting technique by a particular research group is a bewildering characteristic common to most studies of Roman painting techniques, again rising questions about possible causes. Considering the different paint media identified in Roman wall painting, the similarity in the binders detected by each team in samples of various wall paintings is worth mentioning. This similarity may suggest the existence of a common painting technique, characterized differently by each research group. The hypothesis of the existence of a dominant painting technique serves as a theoretical background for the current theory of fresco, based on the common technical characteristics displayed by Roman wall paintings. The clustering of each type of binder around a specific research group, shown in Table 1, appears highly unlikely. It may indicate the presence of confounding factors in the analytical approach used, thus causing skewed results. The possible presence of these factors is further emphasized when different researchers analysing the same samples come to different conclusions. One relevant example can be found in the Roman wall paintings from Casa del Mitreo in Mérida, ascribed to emulsified beeswax paint by one research team and to fresco by another [23, 24]. Which potential confounding factors could be impacting the puzzling results obtained in analyses of Roma wall paint media? Most studies of ancient binders acknowledge considerable difficulties in accurate identification due to the degradation of the original compounds, the mixture and interaction of materials present in the preparation, paint and protective layers, and the small sample size [25–27]. Besides these factors, often taken into account in such studies [28–34], are two other factors, not usually considered in literature, which may have a decisive influence on results: the difficulty in efficiently extracting organic binders from ancient paint samples, and the presence of organic material due to microbiological contamination. The first time the author of this work carried out a study to determine the composition of binders in Roman murals, the extraction method used was developed in the same laboratory in which the study was performed1, and it was successfully used to analyse the composition of paints dating from recent centuries, as had been commonly studied in that laboratory . The Roman samples analysed were taken from unrestored Roman wall paintings from Mérida and Complutum (in Spain) and Marsala (in Sicily). The analysis of these samples by GC–MS showed no presence of organic material, suggesting that an inorganic paint medium had been used. This data together with the identification of calcium carbonate in the paint layers seemed to indicate that the Roman murals under analysis were painted with fresco. In order to check for presence of organic compounds in the samples, the inorganic residue of the extractions was subsequently analysed by FTIR. The spectrograms indicated presence of organic materials, suggesting that the extraction method was not appropriate for ancient paint binders. After subsequent use of a more efficient extraction method, analysis by GC/MS allowed the hypothesis that emulsified beeswax could have been the paint medium used in all the murals analysed . The difficulty in extracting ancient paint media and its possible influence in the analytical results suggests that this issue should be taken into full account when characterizing ancient painting techniques. However, the absence in most of the studies of remarks on the use of extraction methods suitable for ancient binders, or of tests to assess their efficiency, may generate doubts about the suitability of the extraction methods used in some analysis. Table 1 shows that some studies are carried out with extraction yields of less than 0.1% of the paint weight. This amount of binder would seem insufficient to fix the pigment to the support, or to explain the stability of the painting, thus allowing the hypothesis that part of the binder may not have been extracted, which would produce an incomplete characterization of its composition. This possibility might further suggest a link between the extraction methods used and the results obtained, making advisable an assessment of the efficiency of the extraction methods used in characterizing ancient paint media. Moreover, the usual presence of microorganisms in ancient wall paintings can provide an additional source of organic material which could be mistaken as part of the original binder. This presence, not generally considered in analyses of Roman wall painting, may modify the results of an analysis, particularly when combined with low extraction yields. Studies of ancient organic binders which identify the painting technique as fresco are of particular interest. This painting technique does not require any organic binder, so it would seem reasonable to ascribe the lack of detection of such binders to a painting executed in fresco. However, if the extraction method used was not efficient enough to detect the presence of an ancient organic binder, the conclusions reached could be inaccurate. In order to assess this possibility, it is useful to review the paint analysis in Greco-Roman polychrome sculpture. 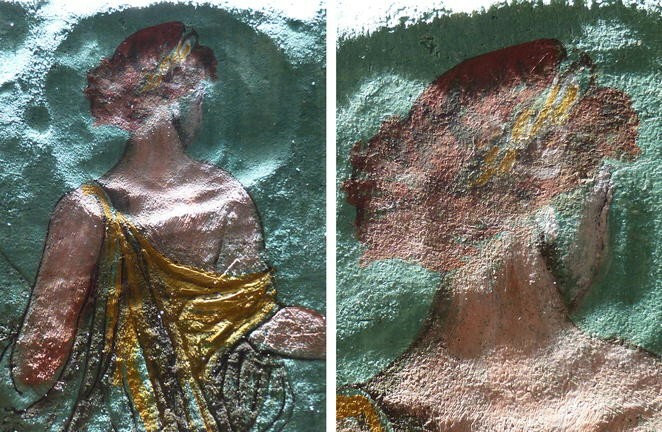 As the paint used in sculpture requires an organic binder to fix the pigments to the support, the lack of identification of organic binders has to be ascribed to the use of a fresco painting technique, and may instead be taken as proof of the difficulty to characterize ancient paint media. A review of the literature on ancient polychrome sculpture shows that, often, studies analyse only pigments [36–39] or are unable to identify the binder [40–42].2 The result is a lack of understanding of the painting techniques used in Greco-Roman polychrome sculpture, as summarized by Kenneth Lapatin: “ancient binders have yet to be identified, and the original painting and finishing techniques are far from well understood” . Transferring these results to mural painting, it could be hypothesized that the reason some chemical analyses of Roman wall paintings have not detected any organic binder is due not to execution in fresco, but to the difficulty in extracting the original paint medium. Also noteworthy are studies of Roman wall paintings in which organic compounds are detected in some samples but not in others found in excavation. As the compounds identified in these studies are usually located on the outermost layer of the samples, it seems reasonable to hypothesise that the original technique was fresco, and that the presence of organic material is due to modern conservation treatments. This is the case in the aforementioned studies by Casoli and colleagues. The detection in these analyses of organic compounds such as wax, egg or animal glue seems to confirm the use of a suitable extraction method. However, if the method used was not suitable to extraction of ancient binders, subsequent analysis might detect the presence of modern binders although they were unable to detect the presence of ancient paint media. Therefore, in this case, it would be necessary to determine the efficiency of the extraction method used. In order to frame the significance of the studies of organic paint media in Roman wall painting as well as the efficiency of the procedures used to extract those media, it may be useful to survey the fresco theory which has for decades influenced conservation studies in this area, and which has not been much subject to critical inquiry. The theory of fresco as the common painting technique in Roman wall paintings was formulated in the mid-1960s by Paolo Mora and Laura Mora, chief restorers of the Istituto Centrale per il Restauro (ICR, now ISCR) and scientific directors of the International Training Courses in mural painting at the ICCROM (International Centre for the Study of the Preservation and Restoration of Cultural Property), together with Paul Philippot, director of the ICCROM. 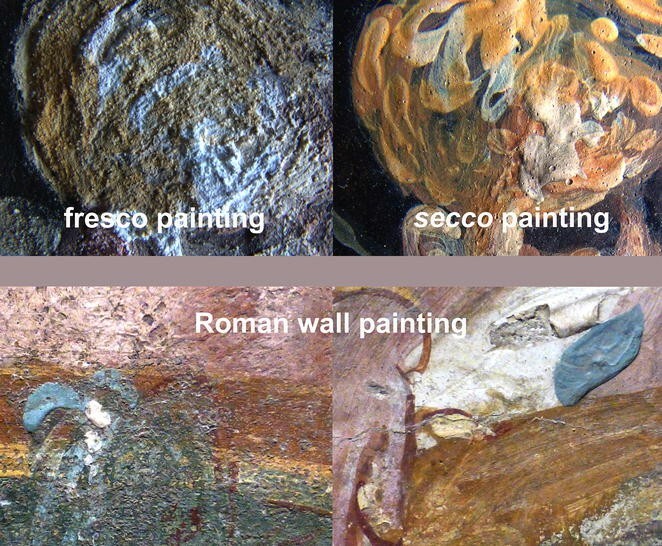 Establishment of the fresco theory allowed the Moras to develop specific conservation treatments for Roman wall paintings, which required that the original painting technique be fully characterized .5 These restores applied conservation treatments for Roman wall paintings developed specifically for fresco painting . Treatments included the removal of all traces of beeswax with organic solvents, as these authors came to consider the presence of beeswax as deriving from prior conservation treatments . The Mora-Philippot theory, backed by the ICCROM’s strong international scientific prestige and outreach efforts, was quickly accepted by the institutions responsible for the conservation of Roman murals, which also adopted the conservation treatments proposed by their authors. Increasing support to research the conservation of cultural heritage during the following decades made possible the undertaking of numerous chemical studies of Roman wall paintings. The results of these studies seemed to confirm the fresco theory: having ruled out the presence of organic paint media, these analyses focused on characterization of the inorganic compounds, an approach which still pertains in many studies [52–54]. The presence of calcium carbonate, regularly identified in these studies, was interpreted as confirmation that the painting technique was indeed fresco, without determining whether the calcium carbonate might derive from a lime rendering (common for both fresco and secco painting techniques), or from carbonate minerals added as a pigment or extender . While a number of analyses identified Roman murals as not having been painted in fresco [56–61], these results proved unable to open a debate on the validity of the prevailing theory—a situation which has continued up to the present day. Roman wall paintings occasionally display depressions in coloured plaster backgrounds left by hard polishing tools, imprints made by snapping a cord against the rendering, and impressions made by fingernails . The presence of these marks suggests that this type of coloured background would have been painted onto a fresh rendering. Moreover, Vitruvius writes that colours applied on a damp rendering are permanent, unlike those applied on a dry support , which seems to indicate that Roman artists used a painting technique on fresh lime renderings. Components of this paint medium have been identified in Roman wall paintings from Pompeii, Herculaneum—unrestored , some unrestored , Oplonti, Rome—some of them unrestored—[58, 59], Gijón , and, as previously mentioned, in unrestored samples from Marsala, Mérida, Complutum, Ampurias, Cartagena and Baelo Claudia. Beeswax has also been identified in Thracian wall paintings in Bulgaria dating from the fourth century BC , in Nabataean wall paintings from Petra (Jordan) from the first century BC-first century AD , in Romano-British murals from Verulamium (second century AD) , and in Byzantine wall paintings from Deir el Suriam  and Baouit (Egypt)  from the seventh century AD, suggesting a huge geographical and chronological range of this wax technique in ancient wall painting.9 References to the use of beeswax paint in wall painting found in ancient texts dating from the fifth century BC to the eighth century AD [71–76] also support the hypothesis of the extended use of this wax painting technique in ancient murals. Therefore, the possibility that Roman artists used this technique on fresh lime renderings cannot be ruled out. Fresco is a painting technique on which pigments are applied as a suspension in water onto a wet plaster of lime and a fine aggregate of sand or marble dust. This smooth and thin final coat, called intonaco, is applied on a rough underlayer called arriccio, composed of one or several thicker layers of slaked lime mixed with large granules of sand. The intonaco is smeared onto as much of the arriccio as can be painted in one session. The boundaries of this area, called giornata (meaning one day’s work) are confined along contour lines, so that the joints of each successive section of fresh plastering are less perceptible. The fresco theory states that Roman artists were able to complete in fresco, complex paintings on large-size fresh lime renderings called pontate ,10 without the need to divide the wall surface in giornate. Their authors hypothesized that, although “the large area of the painted surfaces without joints is puzzling” , this could be feasible because the thickness of the mortar and the polishing of the mural would maintain the necessary dampness for a long time. They also mentioned other possible explanations, such as the rapid execution enabled by the use of a repertoire of motifs, or the outstanding skill of Roman artists [78, 79]. An experimental study carried out by Alix Barbet reproducing a Roman wall painting in fresco showed the difficulty of painting a mural the size of a pontata without joints. According to Mora and Philippot, “the typical working surface without joints is around 2 m high by 5–6 m long” . Barbet’s experimental painting measured 2.20 m in height and 4.48 m in length, with a surface of some 9 m2, comparable to that of the average Roman pontata. The execution of the experimental painting required three days (and their corresponding joints in the plaster) and a team of eight painters; still, some areas remained unfinished . The results of Barbet’s study suggest that a Roman pontata would have not been painted in one day and thus would have not been painted in fresco. The hypothesis that Roman artists were aware of a technology that allowed them to paint in fresco for longer periods cannot be accepted without rigorous justification. Mora and Philippot provide no scientific evidence of its feasibility, nor it is found in the literature, and it contradicts the instructions found in treatises on fresco, which establish that fresco paintings have to be executed in giornate. The hypothesis of the repertoire of standard motifs and the outstanding skill of Roman artists would also need further justification, as a similar repertoire is found in Renaissance fresco painting (motifs taken precisely from Roman paintings) and the great fresco masters of that time were unable, despite trained teams, to execute fresco paintings without dividing them into small areas. The theory of fresco states that the common method was “to carry out the whole of the pontata, except for those complex parts where the execution was expected to require more time”, such as “the capitals, pilasters and panels of imitation marble in the Second Style and for a large number of inserted ‘pictures’ from the last phase of the Second Style onwards”. Mora and Philippot consider these areas delimited by joints to be giornate thereby proving the execution in fresco of complex areas. However, the painting of capitals, pilasters, and panels of imitation marble can hardly be considered more complex than the painting of figures, or of elaborate architectural and landscape compositions as seen in the third and fourth Pompeian styles, where no giornate joints are visible, and whose execution in fresco seems hardly feasible without dividing them in areas that could be finished with one day of labour. Furthermore, the insertion of pictures onto finished wall paintings, which necessarily requires a joint between the inserted plaster and the pre-existing mortar, does not permit one to conclude that the picture was painted in fresco, as it could as easily have been painted a secco. 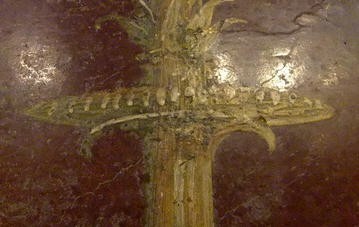 Thus, the presence of this type of joint in some Roman paintings should not be identified as the giornate joints characteristic of fresco painting. This seems also to be the opinion of Mora and Philippot themselves: when they refer to the development of fresco painting in the Italian Trecento, they state that “the earliest giornate date from the second half of the thirteenth century” . This date of appearance of the first murals divided in giornate, also confirmed by other authors [83–86], seems to indicate that wall paintings prior to that time can hardly be considered frescos. It is remarkable that Mora and Philippot, in the early versions of their theory, developed in their words “after many years of research and studies on Roman wall paintings […] with the continued examination of Roman murals with all available means”, did not mention the presence of giornate joints [87, 88]. Considering that their identification of such would be the strongest argument in favour of their theory, the presence of giornate in Roman paintings seems doubtful compared to fresco paintings from the Renaissance onwards, where the presence is easily perceived. In the later versions of the theory of fresco, Mora and Philippot incorporated the argument of the presence in some wall paintings of boundaries separating areas showing differences in the quality of the intonaco and the paint. Tintori and Meiss interpreted these differences—found for example in the Room of the Elephants in the House of the Lararium of Achilles in Pompe—as the result of the execution of monochromatic surfaces painted with an organic paint medium, possibly containing soap, applied onto a fresh plaster and polished while it was still damp . Mora and Philippot, on the other hand, stated that these boundaries found in the Room of the Elephants are giornate which allowed the artists to paint these complex compositions in fresco. In order to study whether these joints corresponded to the giornate joints characteristic of frescos, Shigeru Tsuji carried out a careful examination of the paintings of the Room of the Elephants and other paintings displaying what Mora and Philippot considered to be giornate joints. Tsuji concluded that these joints do not correspond to giornate joints, and that the lack of such joints “leads us to the inference that the Roman murals must have been executed with a technique very different from the buon fresco” . The first versions of the fresco theory stated that mural surfaces were polished with a hard instrument once the painting was finished and while the mortar was still fresh. This polishing would be responsible for the shiny surface and the “characteristic greasy, unctuous appearance”  displayed by Roman murals, remarkably different from the matte and coarse surface of the brushstrokes characteristic of fresco paintings [91, 92]. As Mora and Philippot observed, the strong compression produced by this treatment forces the impastos to sink into the fresh background, completely losing their relief and becoming flush with the plaster surface  (Fig. 1). As impastos in Roman murals show relief and are not flush with the surface, later versions of their theory proposed that strong-pressure polishing applied only to the coloured background, and that a second polishing was applied to the finished painting at lower pressure, while the mortar was still fresh. This second polishing would flatten the impastos only slightly . This hypothesis presents several problems. If the applied pressure were light enough to flatten the impastos only slightly, the brushstrokes would not acquire a shiny, greasy appearance. Moreover, Roman murals show slightly flattened impastos only occasionally. Most often the relief of the brushstrokes do not display any flattening (Fig. 2). This seems to be also recognized by Mora and Philippot, who report that from the Third Style onwards “the amount of polishing was reduced or abandoned completely, in order to enhance as much as possible the rich play of impasto, thus bringing to mind the technique of the pinakes ”. Pinakes are paintings on board, executed with pigments fixed by an organic paint medium. Unlike fresco painting, organic paint media are able to provide brushstrokes that combine relief and a smooth and shiny surface (Fig. 3). Thus, the theory of fresco needs to propose an alternative hypothesis to polishing, in order to explain how a Roman artist could obtain in fresco the surface of the paint characteristic of secco painting techniques. The theory of fresco does not provide an explanation for the presence in Roman wall paintings of pigments which are not alkali-resistant and therefore cannot be used in fresco, such as organic pigments, white and red lead, malachite, or azurite [95–99]. The use of these pigments in wall painting is also reported by Vitruvius, who writes that it was common in his day to cover whole walls with pigments such as malachite, purple and Armenian blue (purple mixed with azurite) , all of which are alkali-sensitive pigments unsuitable for fresco painting. The poor alkali resistance of these pigments was known by Romans, as Pliny warns of their use on fresh lime renderings . The presence of lime-sensitive pigments seems to contradict the basic statement of the fresco theory that pigments were mixed simply with water or lime water and applied on a fresh lime rendering. An alternative hypothesis is that these pigments would have been fixed to the wall by means of an organic paint medium. When Pliny and Vitruvius list the known white pigments, they mention neither lime nor lime white, which are the commonest if not the only white pigments for fresco painting [102–104]. Chemical analysis of Roman pigments seem to confirm that lime and lime white were not used as pigments in Roman murals .11 This remarkable absence does not bolster the theory that wall paintings were painted in fresco. The white pigments listed by Pliny and Vitruvius are lead white, aragonite, craie, dolomite and diatomite —pigments which are excluded as white pigments in fresco treatises . Lead white is alkali-sensitive and darkens in contact with lime, while the others, unlike lime and lime white, are nearly transparent when applied in fresco, meaning that the artist can hardly control the final effect, which becomes much more opaque (Fig. 4). The generalized presence of these pigments in Roman wall paintings suggests that they could have been fixed by means of an organic paint medium. If fresco was the technique commonly used in Greco-Roman wall paintings, it would be reasonable to think that ancient Greeks and Romans had a name to designate this technique and to distinguish from other painting techniques used in wall painting at that time, such as encaustic, whose names (wax and encaustic) are often found in ancient literature. However, no reference has been found in ancient literature naming a technique which could correspond to fresco painting. One possible reason for the absence in records of such a name is that fresco painting technique did not exist in Greek and Roman times. Mora and Philippot state that the fresco painting technique developed in the Italian Trecento was an improvement in relation to the fresco technique used in Roman, Byzantine and Romanic times, as it allowed the execution of complex compositions by dividing the wall into giornate and provided better qualities of surface and texture . This statement seems somewhat contradictory. If Roman wall paintings were fresco, then we should assume that ancient artists knew a fresco technique which permitted the painting of intricate decorations without the need to divide the wall in giornate, thus avoiding all the difficulties of execution associated to this process, including precise planning of the work,12 difficulty in matching colours between contiguous giornate , and difficulty in making corrections once the giornate dried . Furthermore, Roman technique provided brushstrokes of smoother surface than did fresco paintings. In addition, it allowed the use of pigments sensitive to alkalis, unsuitable for the fresco painting technique as we currently know it. Thus, the fresco technique developed in the Trecento can hardly be seen as an improvement over an ancient fresco technique. Because the Roman technique is so different from fresco technique as it is currently known, it would be necessary to detail the composition and procedure of the former, in order to accept it as fresco. Otherwise, this may be taken as an unconfirmed hypothesis which cannot be scientifically assessed. Analyses of Roman mural painting suggest the difficulty in efficiently extracting ancient organic binders. This difficulty is further complicated by the generalized doubts in identifying the paint media used in Roman polychrome sculpture, allowing for the hypothesis that the reason some chemical analyses of Roman wall paintings have not detected any organic binder is not due to their execution in fresco, but to the difficulty in accurately identifying the original paint medium. The use of fresco in many Roman wall paintings is also questioned by technical characteristics such as lack of giornate or the presence of pigments not suitable for fresco, which could indicate the use of a painting technique employing organic binders to fix the pigments. Chemical analyses of Roman wall painting have identified other types of paint binders. A comparative study of these analyses shows a recurring coincidence among the results obtained by each particular research group but a remarkable difference between the results of one group and another. This clustering of results by research groups appears highly unlikely, suggesting the presence in these studies of confounding factors which might be causing skewed results. These factors could be related to the difficulty of extracting ancient paint media as well as to the influence of microbiological contamination. The use of extraction methods unsuitable for ancient paint media may cause some binder components to remain unextracted, producing an incomplete characterization of the composition. The absence of data in most studies on the efficiency of the extraction procedures used in ancient samples and on the influence of microbial contamination may generate doubts around some of the results obtained. These doubts cause uncertainty about the paint media used in Roman murals, and generally in ancient painting. The implications of this uncertainty for the adoption of appropriate treatment interventions, or for the efficient use of resources in order to improve the reliability of results, all suggests the need to assess both the efficiency of the extraction methods used in the analysis of ancient paint media and the possible influence of organic material due to biological contamination. The Smithsonian’s Museum Conservation Institute. “While the results from analyses of antique sculptures from the past 10 years has brought us much forward in terms of knowledge of pigments used […] we are much less informed about the binding media used and thus the overall appearance (matt, shiny, or combinations). This is an area that needs much more attention also in the near future” . “This lack of understanding of the nature and presence of the organic materials used in wall paintings has resulted in considerable damage brought on by misguided restoration interventions. Organic materials are particularly vulnerable during conservation intervention, and identifying their presence prior to treatment is critical to their survival” . “Many recent conservation projects have caused irreparable damage to important wall paintings, owing to a fundamental misunderstanding of original painting technology and the consequent adoption of inappropriate treatment interventions” . “As materials and execution have a direct bearing on the definition and/or selection of treatment procedures, an understanding of Roman mural technology is of even more critical concern in the arena of conservation” . “The determination of Roman painting technique has long being controversial and often passionate, sometimes led by imagination rather than critical thinking, hardly 5 years go by without an enthusiast being convinced of having unravelled the mystery of the Pompeian painting” . Selim Augusti summarised the state of the knowledge in 1950: “Obviously the first problem faced by experts (archaeologists, technicians, and art scholars) has been the painting technique used in the Pompeian wall paintings. […] Mengs, after a long and detailed study of the paintings of Pompeii and Herculaneum, concluded that such paintings could not be but frescoes painted with buon fresco by painters who had to have a unique skill and speed of execution. Requeno, on the other hand, claimed that Pompeian paintings were done with encaustic. Scholars' opinions were divided: some joined that of Mengs (Wiegman, John, etc. ), others, that of Requeno (Donner, Henry and Cros, etc.). Many were the opinions and statements by other scholars: some considered them to be tempera (Carcani, Winkelmann, Schafthäult, etc. ); others with backgrounds done with fresco and figures and decorations with tempera (Overbeck, Müller, Letronne, Woltmann, Mau, Gusman, etc. ); resin-based paint (Knierin, etc. ); milk-and-beeswax-based paint (Geiger); dry fresco (Eastlake); paintings done with several methods and mixed media (Berger, Raehlmann, Laurie); mixed media with overlay of wax; oil paintings; etc. […]. The chemical studies conducted by different researchers […] have yielded uncertain and incomplete results, most of them contradictory" . This reaction does not affect paint layers applied on the coloured background as they are isolated from the mortar by a wax paint layer, remaining sensitive to wet and dry scrub. In most of these studies, the wax detected was present in all the paint layers integrated into the mass of the colours, which would indicate that this wax was not a protection layer of the finished mural, but a component of the paint medium. Nonetheless, some researchers consider that the wax identified by chemical analysis comes from a surface treatment applied to a fresco painting. It should be noted that the identification of a surface treatment does not provide any indication of the paint medium used to fix the pigments. The hypothesis of waxed fresco murals would require evidence of the feasibility of executing fresco paintings in pontante and using lime-sensitive pigments. Pontate are plaster patches divided by suture lines produced by the plastering being executed separately on different days. Pontate are mostly found in secco painting and do not necessarily bear any relation to the painted figures but only to the position of the ponte (scaffolding) and which are commonly composed by long horizontal or vertical straight lines . Bearat concludes that the studies reporting presence of lime white in Roman wall paintings are incorrect . Thus the need for the sinopia—a sketch of the painting carried out on the inferior mortar layer—which allowed the artist to determine the extent of the surface that he was to paint a fresco in one day. Jorge Cuní is technical director of Encáustica Cuní -DIRSA, which produces water soluble encaustic paint for artists. Museo Archeologico Nazionale, Naples. http://cir.campania.beniculturali.it/museoarcheologiconazionale/percorso/nel-museo/P_RA1/RIT_RA87?page=1. Accessed 30 May 2016. Museo Nazionale Romano—Palazzo Massimo, Roma. http://archeoroma.beniculturali.it/en/national-roman-museum-palazzo-massimo-alle-terme/paintings-and-mosaics/painted-garden-villa-livia. Accessed 30 May 2016. J. Paul Getty Museum, Los Angeles. http://www.getty.edu/art/collection/objects/6523/unknown-maker-wall-fragment-with-a-peacock-roman-about-70/. Accessed 30 May 2016. Museum of Fine Arts Boston. http://www.mfa.org/collections/object/fresco-panel-10. Accessed 30 May 2016. Metropolitan Museum, New York. http://www.metmuseum.org/art/collection/search/250939. Accessed 30 May 2016. Musée du Louvre, Paris. http://cartelfr.louvre.fr/cartelfr/visite?srv=car_not_frame&idNotice=2786&langue=fr. Accessed 30 May 2016. Museo Nacional de Arte Romano, Mérida. http://ceres.mcu.es/pages/Main?idt=10619&inventary=CE23962&table=FMUS&museum=MNAR. Corso G, Gelzo M, Vergara A, Grimaldi M, Piccioli C, Arcari P. Pigments and binders in Pompeian four styles wall paintings. Built Heritage 2013 Monit Conserv Manag. http://www.bh2013.polimi.it/papers/bh2013_paper_105.pdf. ICOMOS principles for the preservation and conservation/restoration of wall paintings. Ratified by the ICOMOS 14th general assembly, in Vicoria Falls, Zimbabwe; 2003. http://www.icomos.org/en/what-we-do/focus/179-articles-en-francais/ressources/charters-and-standards/166-icomosprinciples-for-the-preservation-and-conservationrestoration-of-wall-paintings.